This addition to the Crossrange Collection is designed to increase your peripheral view with its extended rectangular lens shape, and the frame&###x2019;s interchangeable design lets you convert it for sports with accessory temples and nosepads. 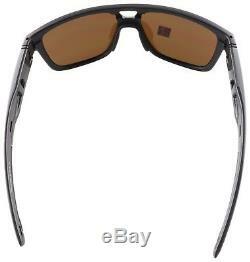 Frame Color: Matte Black Lens Color: 24K Iridium. Temple Arm Length: 137 mm. 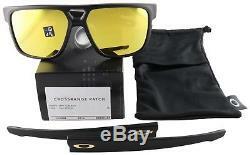 Comes with Oakley Box - Temple / Nosepad Set - Microbag - Papers. Item must be sent back in the same NEW original condition as received with all original accessories. This addition to the Crossrange Collection is designed to increase your peripheral view with its extended rectangular lens shape, and the frame’s interchangeable design lets you convert it for sports with accessory temples and nosepads. Frame Color: Matte Black Lens Color: 24K Iridium Lens Width: 60 mm Lens Height: 45 mm Bridge Width: 14 mm Temple Arm Length: 137 mm Comes with Oakley Box - Temple / Nosepad Set - Microbag - Papers. The item "Oakley Crossrange Patch Sunglasses OO9382-0460 Matte Black 24K Iridium Lens" is in sale since Sunday, May 20, 2018. This item is in the category "Clothing, Shoes & Accessories\Men's Accessories\Sunglasses & Sunglasses Accessories\Sunglasses". The seller is "world-of-optics" and is located in Fort Lauderdale, Florida. This item can be shipped to United States, Canada, United Kingdom, Denmark, Romania, Slovakia, Bulgaria, Czech republic, Finland, Hungary, Latvia, Lithuania, Malta, Estonia, Australia, Greece, Portugal, Cyprus, Slovenia, Japan, China, Sweden, South Korea, Indonesia, Taiwan, South africa, Thailand, Belgium, France, Hong Kong, Ireland, Netherlands, Poland, Spain, Italy, Germany, Austria, Bahamas, Israel, Mexico, New Zealand, Philippines, Singapore, Switzerland, Norway, Saudi arabia, Ukraine, United arab emirates, Qatar, Kuwait, Bahrain, Croatia, Malaysia, Brazil, Chile, Colombia, Costa rica, Dominican republic, Panama, Trinidad and tobago, Guatemala, El salvador, Honduras, Jamaica, Antigua and barbuda, Aruba, Belize, Dominica, Grenada, Saint kitts and nevis, Saint lucia, Montserrat, Turks and caicos islands, Barbados, Bangladesh, Bermuda, Brunei darussalam, Bolivia, Ecuador, Egypt, French guiana, Guernsey, Gibraltar, Guadeloupe, Iceland, Jersey, Jordan, Cambodia, Cayman islands, Liechtenstein, Sri lanka, Luxembourg, Monaco, Macao, Martinique, Maldives, Nicaragua, Oman, Peru, Pakistan, Paraguay, Reunion, Viet nam, Uruguay.